Sunny with rain chances at the beginning of the week. Temperatures fluctuate a bit, corresponding with precip. Rain chances Saturday - Tuesday are low, with the highest being on Sunday, 40%. Highs in the 50s and mid to high 60s; lows in the 30s. What Is a Taxpayer's Association and Why Should I Join? a ghost town for a hundred years. The historic cemetery lists the names of some of Old Blue Valley’s earlier inhabitants but the majority of them are faded and indecipherable. In 1970, when he bought the Blue Valley and its 3,200 acres, Kelly Taylor was quite unaware of the history of the place he had just acquired. Born in the Loa / Fremont area, Taylor relocated to grow corn and sorghum for a cattle feedlot in the more amenable climate of the Lower Valley. ALL content for THE WAYNE & GARFIELD COUNTY INSIDER must be submitted by FRIDAY AT NOON to be included in the following Thursday edition of the paper. Letters to the Editor Send us your letters. Your thoughts, opinions, and notes to the community are important to us and we welcome your submissions. Letters to the editor must include the author’s name and location (town). We may edit letters for length, format and clarity, and we also reserve the right to refuse material. Opinions expressed in letters to the editor are not necessarily those of The Insider. Send letters to snapshot@live.com. (1) Public entities (city, county, state, federal governments) can not sell or buy any property without appraisal report (how much it is worth) from certified licensed appraiser. This is worldwide law in civilized societies. Otherwise government cronies (city council member to US congress member) would sell public properties at pennies to their own and would sell their own properties to tax payers for millions. (2) Panguitch City council’s intention to grab Cameron Motel is for years. First the city council tried to shake up the owner thru threat to condemn it. Garfield County building inspector warned the city council that the city would have to condemn lots of other properties. So the city backed off. (3) In 2018, the city got it appraised. The value came out $40,000 to $90,000. In the auction, the city could not go above $90,000. The bid went up to $150,000. (4) Now the city wants to buy it for $160,000 and Garfield County is partnering for 50%. This means Panguitch City will pay $80,000 and Garfield County will pay $80,000. (5) Also, according to county, there is an asbestos issue. So lets say that would require another huge chunk (>$150,000 ?). (6) Now you got flat piece of land for >$300,000 that has county value of <$35,000. (7) Now what is the plan on it ? Where is the cost for that ? (8) How is boulder resident going to enjoy that in Panguitch ? (9) Mr. Barry Huntington (Garfield County Attorney / prosecutor / counselor + Panguitch City’s attorney) sits in the meetings and advises the entities. (10) Credibility - Where is the record of financial ditches of CCC arena (>$2 million baby), Base ball diamond (>$1 million baby), Airport (>$2 million baby), etc. ? Folks! Wake up and wake the county commission up. HARSHAD P. DESAI ber of deer that congregate to one small area, according to DWR big game coordinator Covy Jones. It can also increase disease concerns, and suddenly introducing a higher-nutrient feed when the deer have adjusted to a lownutrient feed during the winter can kill them. "A changing diet can be hard on deer," Jones said. "They are ruminants and have a bacteria in their gut that digests the feed. Because of that, it can take weeks for them to adjust from a diet of lownutrient woody vegetation to high-nutrition forbs and grasses. When a diet change occurs too quickly, some deer can die in the process." Overall, feeding deer isn't good for populations. When deer are being brought feed to their location during the winter, it causes them to congregate into a small area, and they end up kicking the fawns out of the herd, which increases their mortality rates. "We balance what is best for the deer populations, what is best for the habitat and what is best for the other animals that depend on deer for food,"
Mack Oetting - FYI Panguitch Peg Smith - By Way of Boulder The Insider is a weekly community newspaper delivered each Thursday to households in Wayne and Garfield counties, Utah. The entire contents of this newspaper are © 2015 The Insider/Snapshot Multimedia, LLC. The Insider reserves the right to edit or reject any advertisement or submitted content items. Articles submitted by independent writers may or may not be the opinion of The Insider. Please feel free to contact us for advertising rates and with any questions regarding content submissions. 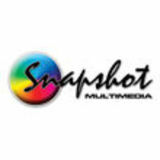 We prefer content and ads submitted by email to snapshot@live.com but we will accept your information any way you can get it to us. Subscriptions to The Insider are available outside of Wayne and Garfield counties for $40 for 26 weeks, $75 per year. Senior discounts are available. Content and ad deadline: Friday at Noon Have a news tip or story idea? them into a chicken coop. Another option is to find a flowering plant that will attract natural predators of the pest. For deer, Allen suggests growing a periphery of “deer candy,” plants that deer particularly like, outside of the garden. One audience member suggested mulberries. The deer will then be less likely to enter the garden. Another audience member described a trick for removing large colonies of ants: first, place a bucket of compacted sand above an established ant hill. Many ants will move into the bucket, which can then be dumped into a chicken coop or elsewhere. An entire ant hill may gradually be removed in this way, without the use of chemicals. Allen also suggested that we reflect on, and potentially raise, our own tolerance levels. “Everything has the right to live,” Allen stated, and encouraged learning how to share with our animal, bacterial, and autotrophic neighbors. “Eradication [of a pest] is extremely impractical and unwise,” he said; not only is it nearly impossible but it can also cause unforeseen and often unfavorable consequences. We, as humans, have access to food supplies that other creatures do not. If severe drought causes gophers to eat more of our tomatoes, can that be okay? Can we plant extra? Can we be willing to share? One audience member spoke about the gardening philosophy in their household: “Plant three times: once for the weather, once for the predators, and once for yourself.” Though the system is large and complex, with careful research, gradual implementation, and attentive monitoring, humans, as a part of this system, have the ability to contribute positively to a balanced ecosystem. Boulder Tree City is committed to enhancing community knowledge about tree tending, by providing workshops, a resource collection at the Boulder Library, as well as fostering a community space for orchard trees in the Boulder Town Park. has been his assistant for ten of those Championships. Tammy had a lot to do with these championships, working with the younger players and the JV teams, getting them ready for championship play. Both will be missed greatly, but all good things come to an end. There are openings for their jobs, so all of you Monday morning quarterbacks get signed up. WITH A SATELLITE OFFICE NOW IN PANGUITCH. Jeffery J. McKenna is a local attorney serving clients in Utah, Nevada, and Arizona. He is a shareholder at the law firm of Barney McKenna and Olmstead. He is a founding member and former President of the Southern Utah Estate Planning Council. If you have questions regarding this article or if you have a topic you wish to have addressed in this column, you can call 435 6281711 or email jmckenna@ barney-mckenna.com. less for their services than less experienced and less qualified planners. In conclusion, there are several factors that should be considered in the selection of an estate planning attorney. After considering the items discussed in this article and after meeting with the attorney, the most important factor may just be how does the estate planning attorney make you feel when you are with him or her. You should feel comfortable and not intimidated. Most importantly, the estate planning attorney you select should make you feel that he or she is there to serve your and your family’s needs and should never act like your needs are a burden. Although our choir generally practises together, occasionally we split into sectionals: basses with tenors (men), altos with sopranos (women). Each group requires a pianist. As we were preparing for one concert, our choir director, who is also a pianist, thought it wise to split into our sectionals to practice. She turned to one lady, another pianist, and instructed, "I'll go upstairs with the women while you play with the men." Over the years, my husband and I have usually managed to decode the cute but confusing gender signs sometimes put on restaurants' restroom doors (Buoys and Gulls, Laddies and Lassies, etc. ), but every so often we get stumped. Recently my husband Dave wandered off in search of the men's room and found himself confronted by two marked doors. One was labeled "Bronco," and the other was designated "Cactus." Completely baffled, he stopped a restaurant employee passing by. "Excuse me; I need to use the restroom," Dave said. Gesturing toward the doors, he asked, "Which one should I use?" "Actually, we would prefer you to go there," the employee said, pointing to a door down the hall marked "Men." "Bronco and Cactus are private dining rooms." Two mothers met for coffee. "Well Ruthie, how are the kids?" "To tell you the truth, my son has married a real tramp!" says Ruth. "She doesn't get out of bed until 11. She's out all day spending his money on Heaven knows what, and when he gets home, exhausted, does she have a nice hot dinner for him? Ha! She makes him take her out to dinner at an expensive restaurant." "Oh! What a shame. And how about your daughter?" "Ah! Now there's a lucky girl. She has married a saint. He brings her breakfast in bed, he gives her enough money to buy whatever she needs, and in the evening he always takes her out to dinner at a nice restaurant." On her forty-first birthday, a woman received, among other presents, an extravagantly expensive wrinkle-removing cream from her teenage daughter. "And what did she give you last year?" a guest asked the mom. Her reply without hesitation was: "The wrinkles!" Those bathrooms with the light switch on the outside are solid proof that most architects don't have siblings. Call by 10:00 A.M. if you want a lunch or need a ride. 679-8666 All meals are served with milk & bread Suggested donation is $3 for seniors and $7 for those under 60 years of age. TEASDALE - A memorial remembrance of Arthur Adelmann will be celebrated May 4th from 4 to 6 PM at The Lodge at Red River Ranch. If you knew and loved Arthur please join us. Full service accounting firm Personal and business tax preparers (all states) Payroll and bookkeeping Quickbooks Pro advisors Year-round tax preparation Don’t pay extra for franchise costs! Drop off your tax information and pick up your taxes in a week, or schedule a block of time for a one-on-one session as your taxes are prepared. Tax Professional for Over 35 Years Call us for an appointment and free consultation. his knee also. A year ago, he didn’t know if he would ever play again. During the 90s, he dominated the golf world, winning 7 or 8 tournament each year, being the #1 golfer for 10 years straight. During that time, he won four Masters Championships. The last one was 22 years ago. Wood's last major championship win was in 2005. However, he has passed Sam Snead in tournaments won with 82. He has also won about 15 foreign tournaments, that don’t count on his totals. His 15 national championships is second only to Jack Nickolas 18. It is an exciting time for golf again, with Tiger back. Thanks to genetic selection, the U.S. chicken industry can now produce a 6.3 pound chicken in just 47 days. That’s twice as fast as it was fifty years ago. Meat processors last year produced 42 billion pounds of chickens. The 400 richest Americans have more wealth than the 150 million adults that make up the bottom 60% of the country’s wealth distribution. competed at the state level and want to attend the national conference in Anaheim. The cost this year is $1600/ student. The Commission approved funding $400/student as there are fewer students this year than last. Next, Erica Walz, editor and publisher of the WayneGarfield County Insider, and Mark Austin, co-owner, requested a retraction of and apology for erroneous statements made by Commissioner Pollock in public testimony before the Utah legislature on February 20. Walz said Commissioner Pollock and Rep. Phil Lyman were testifying in public hearing at a Political Subdivisions sub-committee hearing on behalf of Lyman’s HB 257, a bill that would have prohibited citizens in the smaller rural counties, such as Wayne and Garfield, from the engaging in the process of analyzing/recommending change to their three-commissioner form of county government. [Note: The state’s process entails 1) obtaining sufficient voter signatures in the county to 2) place on the ballot the question of approving or denying formation of a study committee that would 3) spend a year researching costs, options, benefits and weaknesses in order to 4) produce a recommendation that would appear on the next ballot to keep or change the form of county government. Lyman’s bill was approved by the House, but ran out of time to be voted on in the Senate.] In the hearing, Rep.Lyman had claimed “special interest groups” were actively engaging in “hostile takeovers” of local governments, and were moving in “to manipulate and force” these changes. Lyman deferred to Commissioner Pollock when asked to specify. Pollock said he’d give a good example: “the Wayne County Insider” … which is basically a propaganda.” “We know who is running this local paper. We have no defense against the Southern Utah Wilderness Alliance and these special interest groups..” “They got it on the ballot, ‘they’ meaning the outsiders with pressure,” and “out of 2,400 people—and they really don’t know what they’re voting for other than what they read in The Insider. LegaL Notices ANNOUNCEMENT OF APPOINTMENT AND NOTICE TO CREDITORS Laura M. Gray, No. 5960 LAURA MILLIKEN GRAY, PC 1555 East Stratford Avenue #100 Salt Lake City, Utah 84106 (801) 983-3309 (801) 315-0008 (Fax) Lgray@lmglaw.net Attorney for Successor Trustees IN THE MATTER OF THE TRUST ESTATE OF: Arthur R. Adelman, Deceased. Need to give public notice about a town meeting, budget proposal, or seeking public comment on a prospective project? Page 9 Rural West Conf. stay in local accommodations at the end of the day. Wasatch County is the 4th fastest growing county in the US, and Midway didn’t wish to become “another Moab!” The fact remains, however, that more and more “amenities migrants” are purchasing or building homes in many small rural communities that had previously had a fairly homogeneous population of farmers, ranchers, miners and proprietors of the small businesses that supported them. Moab was one such town that didn’t start to get a handle on its growth spurt in the 80s and 90s in time to prevent some lessthan-optimal growth it is now grappling with. A major challenge for attractive small rural towns now is to ensure sustainable growth by enacting policies that reflect the capacity of an area to absorb in-migration and all that it entails, including affordable housing, adequate infrastructure and attractive surroundings, including open space. Among the numerous excellent presenters was Nan Groves Anderson of Torrey, representing the Governor’s Office of Rural Development, who provided information about the numerous state programs to towns experiencing or anticipating this sort of growth. In particular, the Rural Online Initiative (ROI) strives to provide broadband connectivity to remote locations, which will enhance all phases of life, from education to health care to marketing and access to national and global online opportunities. She and several presenters emphasized that recognizing and embracing diversity and change, rather than fearing and resisting them, is the only way to successfully cope with the increasing popularity of the rural American west. For generations people have been drawn to these beautiful places, but they will only stay beautiful if we take realistic steps now to protect what brought us all here in the first place. USU SUMMER INTERN Don’t miss out on $4,000 this summer! Applications are being accepted until MAY 1, 2019. Apply for the USU Summer Intern position by contacting GaeLynn Peterson at gaelynn.peterson@usu.edu or by calling 435-836-1313. Job details include planning and teaching summer camps, working with the USU Extension staff as needed, and assisting with the County Fair. The camps are up to you but typically include a sewing camp, a cooking camp, STEM camp etc. but if you have any fun ideas let’s talk! The pay is $13.50 an hour up to $4,000 so you can basically choose your own hours. If you enjoy working with youth, and like to plan your own programs, this is the summer job for you! Contact USU Extension for further information or if you have questions! Utah State University is an affirmative action/ equal opportunity institution. GRAND STAIRCASE ESCALANTE PARTNERS KANAB / SURROUNDING GRAND STAIRCASE-ESCALANTE GSEP EDUCATIONAL DIRECTOR Grand Staircase Escalante Partners is excited to post our full-time Education Director position. This position will have four functions: creating interest and appreciation for National Conservation Lands System; providing opportunities to teach students land stewardship; promoting initiatives to get youth outside and engaged in onthe-ground projects on public land; and supporting youth career development and employment opportunities in natural and cultural resource management. Minimum Requirements: Bachelor of Science degree or college-level teacher education credentials and classroom experience. Desire to work with students, teachers, and district staff. Working knowledge of Microsoft programs and Global Positioning Systems (GPS). Must pass educational security background. Compensation includes paid holiday, vacation and sick time-off. Health Insurance, 401k. Salary range $42,000 - $46,000 based upon experience. Position will ideally be based out of Kanab, UT but qualified applicants in other locations surrounding Grand Staircase-Escalante will be considered. Visit www.gsenm.org for full position description. Submit resume and cover page to admin@gsenm.org Closes April 29, 2019 GSEP COMMUNICATIONS ASSISTANT Grand Staircase Escalante Partners is excited to post our part-time Communications Assistant position. This position will be responsible for the GSEP website, quarterly newsletter production, public outreach through social media, email, press releases, etc. Must be proficient in Microsoft Office and Google Docs. Excellent written communication and email etiquette skills. Understanding of social media operations and be willing to create a personal Facebook and Instagram profile. Experience with email marketing and WordPress front end development preferred. Position will work 10-20 per week. Occasional weekend or evening support may be required. Pay range $1520 per hour, depending on experience. Location is flexible, though within the gateway communities of Grand Staircase Escalante National Monument is preferred. Visit www.gsenm.org for full position description. Send resume and cover letter to admin@gsenm.org. Closes April 29, 2019. Do you need an Announcement placed in The Insider? POSITION ANNOUNCEMENTS POSITIONS AVAILABLE: Garfield County School District is hiring the following positions. For a description of each, please see the district website www.garfk12.org Speech Language Pathologist for the Garfield School District ESL/Spanish Teacher for Bryce Valley Schools Teacher for Bryce Valley Elementary School Teacher for Escalante Elementary School Teacher and/or Counselor for Escalante High School Carpenters for Garfield County School District Para Professional for Bryce Valley Elementary School Para Professional for Escalante Elementary School Para Professionals for Panguitch Elementary School Food Service Worker for Boulder Elementary School Substitute Custodians, Food Service, and Teachers Language Arts Teacher for Escalante High School SALARY: Please see 2018-2019 Garfield County School Districts Classified Salary Schedule and Certified Salary Schedule. QUALIFICATIONS: Applicants must be fingerprinted and satisfactorily pass an employment background check. Applicant must work well with children. See the job description for additional requirements. APPLICATION: Interested individuals should submit a Garfield County School District classified or certified application. Please direct questions to: AES Teacher Sierra Westwood (435-624-3221) BES Head Teacher Elizabeth Julian (435-335-7322) BVES Principal Layne LeFevre (435-679-8619) BVHS Principal Jeff Brinkerhoff (435-679-8835) EES/EHS Principal Shawn Bybee (435-826-4247) PES Principal Nick Reynolds (435-676-8847) PHS Principal Russ Torgersen (435-676-8805) District Office Tracy Davis (435-676-8821) Online application available: www.garfk12.org Applications will be screened and the most qualified candidates will be granted interviews. DEADLINE: See the district website for closing date of each position. Garfield County School District is an equal opportunity employer. Garfield County School District reserves the right to accept or reject any or all applications. PANGUITCH DENTAL OFFICE DENTAL HYGIENIST We need a great Dental Hygienist to join our team in our Panguitch Dental Office. Panguitch Dental is looking for a permanent part-time Registered Dental Hygienist to work in our office 2-3 days a week doing single chair hygiene from 8:00 a.m. to 5:00 p.m. We use Dentrix and Dexis software. Candidate needs to be willing to work as a team, provide excellent hygiene skills and great patient care. We have an excellent team and are looking for someone who can join with us to provide the best dental care for our patients. Benefit package available and wage is depending upon experience. Please send resumes to tpace@ waynechc.org. MEETINGS Tropic AA meeting Wednesday at 6 PM. Tropic Heritage Center. All meetings are closed discussion. DEPUTY RECORDER/ SURVEYOR Garfield County is accepting applications for the position of Deputy Recorder/Surveyor. Applicants should have a knowledge of GIS systems, legal descriptions and CAD drafting and the ability to work well with the public. Surveying experience/license is preferred. Applications are available at the Garfield County Clerk’s Office 55 South Main, Panguitch and will be accepted until 5 p.m., Friday, May 10, 2019. Garfield County reserves the right to accept or reject any or all applications. Garfield County is an equal opportunity employer. FRONT DESK / GAS STATION CLERK TROPIC Help wanted front desk and gas station clerk. Part-time or full-time with possible year round employment. Bryce Pioneer Village, call Travis for more information 436-616-8337 or pick up an application at the motel front desk. 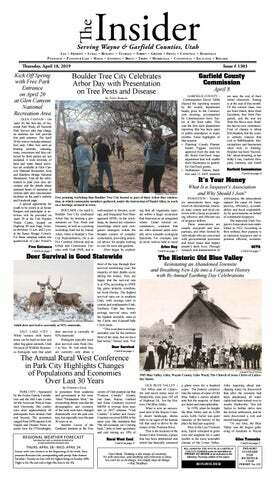 The Insider is the newspaper of general circulation for Wayne & Garfield counties, Utah.